As World War II winds to a close, Europe's roads are clogged with twenty million exhausted refugees walking home. Among them are Jacob and Sarah, lonely Holocaust survivors who meet in Heidelberg. But Jacob is consumed with hatred and cannot rest until he has killed his brother's murderer, a concentration camp guard nicknamed "The Rat." Now he must choose between revenge and love, between avenging the past and building a future. Martin Fletcher, who won the National Jewish Book Award for Walking Israel, proved his chops as a novelist with The List, which was selected as the One Book, One Jewish Community title for the city of Philadelphia. 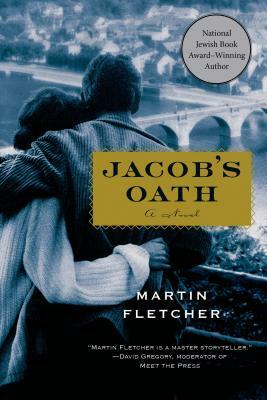 Now, in Jacob's Oath, Fletcher brings us another touching novel of love, loyalty, and loss, set in the aftermath of the Holocaust.